Microsoft has revealed that the world is ready to start using tablets and smartphones as second-screen devices and even if they're not SmartGlass will entice them. SmartGlass was unveiled at E3 and is a companion app for PCs and your mobile devices. The idea is SmartGlass-friendly content will wake the app up and deliver extra functionality and features. The demo at E3 was of an interactive map for HBO fantasy drama Game Of Thrones. Currently there are a number of second-screen apps on the market – Zeebox being the most well known – but Microsoft believes SmartGlass is the key to finally bringing the right content to second screens rather than just white noise. "Consumers are driving the multiple screen environment. There's no unifying purpose [with these devices], however. But the next stage is to get each screen and each device working together," explained Neal Thompson, general manager of the consumer channels group at Microsoft, at the Future of Entertainment Summit in London this week. "We need to join the dots between these multiple screens. 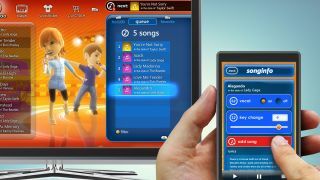 The Xbox SmartGlass app connects phones, tablet in one place. "Second screen functionality is something that consumers are ready for but we are not asking consumers to buy new technology. Xbox SmartGlass is an open eco-system – our goal is to make it available to all devices. Thompson continued: "It needs to be a seamless experience on all devices. As these new patterns of entertainment evolve our strategy is simple: work with the best content partners and give them a good platform to work on. We are reaching for the future today." This unifying experience has taken a step forward with the announcement of Windows Phone 8, a mobile operating system that's based on the same kernel as Windows 8 for PCs. "Windows 8 is the fundamental change for us," explained Thompson. "It will arrive on tablets, PCs and phones. "It will allow the consumer to navigate around the content the same way on all of their devices."